Christmas is coming, the goose is getting fat, please put a penny in the old man's hat... oh, excuse my singing, I get carried away when it comes to Christmas. And it's true, Christmas is coming. As of this moment, there are 74 days, 23 hours, and 48 minutes -which is roughly 2.5 months, but who's counting? My Christmas preparations are divided into three sections - early out, Christmas tree, and late out. Then comes the Christmas tree bins that include ornaments for the tree, garland, and wreaths - time to check the string lights and buy new if needed, bring poinsettia into the house, buy and trim the tree and deck the halls with garland. We buy real trees and so we wait until around the 10th of December to bring one home. This is when we trade babysitting duty within the family so each of of can do some secret shopping. I normally get all of the little ones one night for a snowball fight, cookies & cocoa, and Christmas movies snuggled warm under fluffy blankets - it's become a tradition. The late outs include stockings, our traditional "Night Before Christmas" book, the tray we serve Santa his cookies and the reindeer their carrots on. All the things that are last minute. The big night is almost here! The early out section is fast approaching. 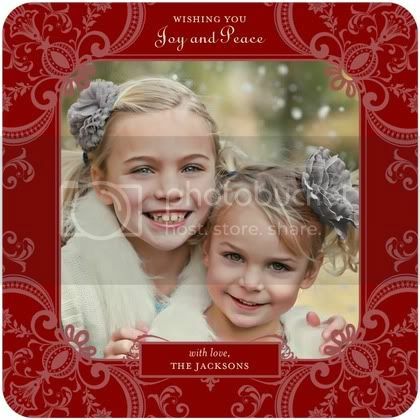 We have plans for family pictures next week that will adorn our holiday cards. Our cards this year will be from Tiny Prints. They just do it right. I have had business cards & birth announcements done through Tiny Prints. They always offer the best selection in a user friendly design format so that you get exactly what you want. There is something for everyone at Tiny Prints. Just take a look - whether you like traditional, or modern, simple, or ornate, you'll find a design that you fall in love with- actually you'll find many - that's the hard part! I think this is the one we've chosen for this year! So here's to your early outs - they'll be here before you know it! I came across you blog and I'm surprised how organized you are when it comes to Christmas! I definitely need to be more so.